Boise Troop 33 - Scouting Rocks! Starting in May, the PLC will be meeting during the regular meeting. After the opening, Scout leaders will break off to hold our monthly meeting. Troop 33 for Girls has formed. Join us Tuesday nights at 6:30 pm. (new start time). The Troops and Crew start the evening together then break off to hold their own meeting. The door to the meeting hall is on the corner of 9th Street and State. Head down the stairs. The Pack meets at 6:30 pm on the ground level just inside the door. Pack 33, Troop 33 for Boys, Troop 33 for Girls, Crew 33 has a fantastic activities for individuals and families. Stop by and check us out! Many Adventures over the last year! 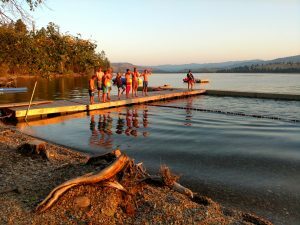 Some of the adventures include summer camp at Melita Island in Montana, backpacking trip into the Sawtooths, and hiking in Utah’s Canyon Land area. Every month an adventure! Hope to update this site and Facebook as time allows. Most of the postings and schedule are on scoutbook.com. The troop was able to record the eclipse from the drone. Launched above the trees just before totality, the video shows dramatic lighting changes to landscape to the west. 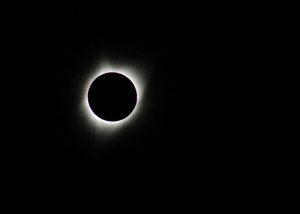 We were less than 5 miles from the center totality line, in the mountains north High Valley Idaho. 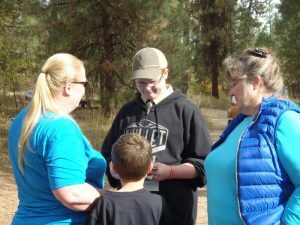 The campout was a blast with the day before flying the drone, plant identification activity, games, wonderful food, worked on the BSA eclipse award, and ended the event with eclipse 2017. Sage is now an Eagle Scout! Sage has earned Eagle Scout rank. His write up has been approved. Congratulations!